FIBRE IDENTIFICATION-SOLVENT TEST – The knowledge of identifying the textile fibres helps a producer of garments to identify the type of fibre and the care to be taken in maintaining the fabrics made of particular type of fibre. This is important factor for labelling of the garments, which includes specifying the fibre content in the garment. There are different tests which could be used for the identification of the textile fibres such as burning test, microscopic test, solubility test, optical test, density test etc. These tests are useful and simple to perform and also provide ready identification under certain circumstances. The solubility of a fibre in a particular chemical agent is a means of idenfication.The fibre can be placed in a chemical at a particular temperature and the solubility will confirm the type of fibre. The chemical properties of fibers include the effects of chemical agents including acids, bases, oxidizing agents, reducing agents, and biological agents such as molds and mildews on the fiber and light and heat induced chemical changes within the fiber. 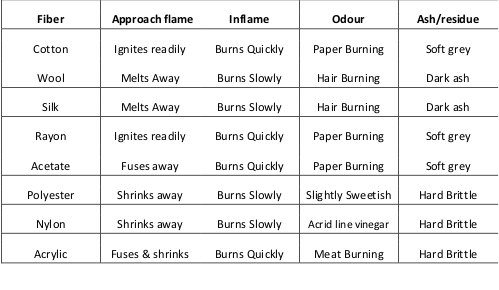 The reaction of fibers to heat from an open flame is a useful guide in identification of fibers. The specific gravity of a fiber is a measure of its density in relation to the density of the same volume of water, and provides a method to relate the mass per unit volume of a given fiber to that of other fibers. The information above is verry helpfull. Sir i am a student and i am studying about paperboard and how to idntify it with a test method. Can you please guide if some test can be done as similar with textiles for paperboards as well so to identify and differentiate. A test which confirms the type of paperboards.